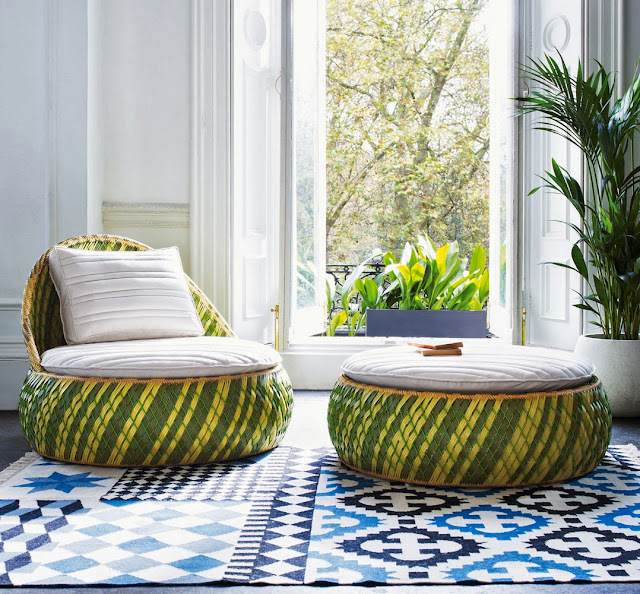 Designed for life outside, this gorgeous range of Dedon furniture, created by the talented American Stephen Burks, takes inspiration from the improvised seating arrangements of the developing world and the skillful artisans who inhabit it. The pieces are formed by constructing a colourful powder-coated frame of aluminium on to which is woven a colourful mesh which uses fibres made from recycled food and drink packaging. The comfortable cushions are made from high-tech Batyline fabric. The collection, called DALA, consists of a lounge chair, footstool and stool or side table. It is available in the UK via Heals and here in Australia from Cult showrooms from October 2013. Read more on the latest outdoor furniture in my article for The Sydney Morning Herald in Life & Style for Fairfax Media.